MooCash Invitation Code(CBGXZI) & Review: Should you join it? Earlier, known as Moo Locker, MooCash is an app that pays you for installing app & games, completing easy offers and tasks. MooCash is one of the best and highest-paying money-making apps. And available for both iOS and Android. Currently, you can get 20 bonus coins when you enter a referral code on sign up. You can get the bonus by entering my referral code: CBGXZI. 1. Download the Moocash app for Android or iOS. 2. 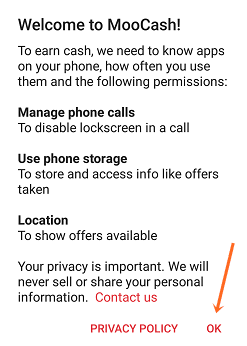 Open the app, tap ok and give the permissions. 3. View the slides or tap the "Earn Cash now" button. 4. 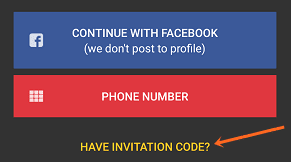 Tap on "HAVE INVITATION CODE?" 5. Enter this referral code: CBGXZI and tap OK.
6. 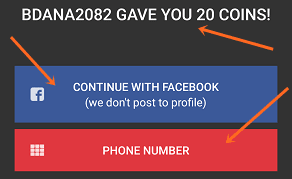 Now sign up with your phone number or continue with Facebook. There are a lot of ways to earn coins on MooCash. You can complete offers & surveys from their partners, complete tasks related to YouTube, Amazon, Facebook, etc. Here, in this review, we’ll talk about all the ‘ways to earn from MooCash app’. Since it’s the simplest I had to put it first. You’ll find all the app download offers listed below the ‘Install to Earn’ segment in the Offers section. The reward is shown at the bottom of every app. To complete these offers tap on the app that you want to install, and if there are further instructions a pop-up will appear with the steps to earn the reward, if not you’ll be asked to select a browser(select the stock browser). And after some redirects, you’ll be taken to the Play store. In this segment, you'll find tasks related to sites like YouTube, Facebook, Quora, TrustPilot, Pinterest, Reddit, SiteJabber and more. For example, under ‘Reviews’, you'll see tasks that pay you for downloading apps (sometimes through VPN), rate the app 5 stars and write a positive review. For every app, the instructions are clearly given which you need to follow to get the reward. Other than the app reviews, there are over 16 different types of tasks that you can complete. Be sure to review that you fulfilled all the requirements of the task before submitting. If your submission is rejected you’ll be charged 5 coins. You can claim 1 Gem Daily. You can also earn Gems by watching videos(brand promotions, movie trailers, game previews, etc.) and. You will get 1 Gem for every 5 videos you watch. But, the question is, what do you do with Gems? Most of the games are gambling based. So, the more Gems you bet the more coins you can win. Other than the above-mentioned methods, you can also earn 1Gems for each friend that enters your invite(referral) code. And when you sign up with this referral code- CBGXZI you’ll get 10 Gems to get you started. Like, PrizeRebel and Swagbucks, MooCash publishes special codes called as MooCodes on its Facebook and Reddit handle. When you enter these codes certain amount of coins will be added to your account. You can also get these codes when you enter into draws. You know what this is. You pay some coins for each Ticket for a lucky draw where you can various items. The more tickets you buy the more your chances of winning are. In MooCash lucky draws, you can win Cameras, Apple watch, Television, bitcoins, Amazon gift cards, PayPal cash, iPad and much more. The price for each ticket can go as high as 2,000 coins depending on the product. 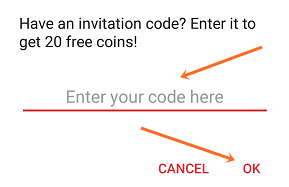 When your friends enter your invitation code or download and register with your referral link they get 20 Coins in MooCash and 10 Gems in MooJoy(they need to register on MooJoy separately to get the bonus gems). And when they redeem you’ll get 10 Gems in addition to 10% of the number of coins they redeemed. Unfortunately, you’ll only earn from your referrals for a year. You will also get 1 Gem when your friends enter your invitation code. 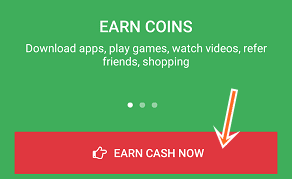 In this section, you can redeem your coins for PayPal cash, bitcoin, Skrill cash, Top-up and more. here you will find power-ups for the MooJoy app. Like, you can exchange coins for Gems at the rate of 10 Coin = 1 Gem, buy VIP Membership. Practice mode to play without gems. One month VIP membership costs 2,000 coins and 20,000 for a year. Power-ups for Moocash only include VIP memberships packs. Cost of one-month membership is 5,000 coins. And 50,000 coins for a year membership. So, should you buy VIP membership? That’s is a bit difficult to answer as they don’t specify exactly how much extra gems/coins you will get as a VIP. But the fact that you need to buy the membership separately for MooCash and MooJoy, makes the deal a NOPE for me. You need to spend way too much on some unspecified “Extras”. While it is true MooCash won’t make you rich but combined with MooJoy it is worthwhile. So, yes you should join MooCash. But I wouldn’t recommend buying those VIP memberships. If you are searching for the #1 Bitcoin exchange company, then you should use YoBit.